ATHENS, Mich.— Michael Alverson, who holds the office of president in this southern Michigan village, takes a certain pride in living in what he calls a "full-service" community. "We have a doctor, a vet, a grocery store, a place where you can get your hair cut and a place where you can get your car fixed," says Mr. Alverson. The one thing Athens doesn't have: a bank. After writing mortgages and taking deposits for nearly 17 years, Southern Michigan Bank & Trust closed its Athens branch two years ago this month, leaving the 1,024 residents here without tellers and safe-deposit boxes for the first time since the Great Depression. 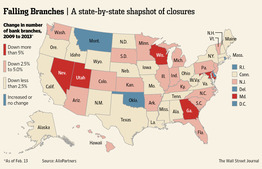 Following years of nearly unchecked expansion, financial institutions across the U.S. are closing thousands of outposts, as pressures mount to cut costs and more customers embrace online and mobile banking. US. banks and thrifts shut 2,267 branches in 2012, according to SNL Financial, a Charlottesville, Va., research firm. That put the US. bank-branch count at 93,000, according to AlixPartners, a New York consulting firm—the lowest tally since 2007. The firm expects the figure to drop to 80,000 over the next decade, putting the total closer in line with 2000 levels. PNC Financial Services Group Inc. said in March that it will close 200 branches this year. The Pittsburgh-based bank operates 2,900 branches. The bank's focus going forward, "will be weighted far more in the direction of technology than teller lines," William Demchak,PNC's president, told investors. Each time a PNC customer deposits a check by snapping a picture on a mobile phone, that saves the bank $3.88 per transaction compared with a deposit at a teller window, Mr. Demchak told investors. Banks say they are closing branches because they are becoming too expensive to operate. Associated Bank, which is the largest bank based in Wisconsin, estimates that each branch shutdown saves the company $300,000. A unit of Associated Banc-Corp, it closed 21 branches last year and is in the process of shutting another dozen. Many industry executives and analysts expect the trend to gain steam in coming years, in a shift that promises to hit smaller communities such as Athens especially hard. Often, these bank branches serve as a town's connective tissue—the place where neighbours gather to catch up on the latest news and goings-on. They are "a symbol of economic health and a vibrant community," says Jennifer Tescher, head of the Center for Financial Services Innovation, a research group that focuses on people without a banking relationship. Nearly 20% of branch shutdowns over the past year were in towns outside the most populated areas of the country, according to the SNL data. And institutions of all sizes are paring back. Bank of America Corp., the nation's second-largest bank by assets, closed about 200 branches last year. Roughly 16% were in rural areas, according to a person familiar with the branch closures. The closures are part of the bank's goal to eliminate some 12% of branches over the next few years. Rob Aulebach, a senior vice president in Bank of America's consumer unit, says customers just aren't coming to the branch as often as they used to. He cites the "tens of thousands" of customers each week who bank on mobile devices. "Convenience is still very important, but convenience means something different than it used to," he says. Banks aren't forgoing new branches altogether. But the new locations tend to be smaller and cheaper. "They have to invest in the new world of technology, but they are still stuck with the costs of the old brick-and-mortar world," says Jens Baumgarten, a managing partner at Simon-Kucher & Partners, a marketing and consulting firm. Americans are increasingly using their phones to avoid a trip to the bank, but they still have little interest in having mobile devices replace their wallets. Eric Morath reports. Not so long ago, it seemed as if there was a bank branch on every corner. The number of US. branches doubled over the past three decades, and the industry has reduced branches just three times in the 77 years since the Federal Deposit Insurance Corp. started keeping track. The passage of the federal Community Reinvestment Act in the 1970s encouraged banks to build branches in poor areas. Although the industry is in far better shape than it was during the financial crisis—banks earned $141.3 billion in 2012, reflecting a 19.3% increase over 2011, according to Federal Deposit Insurance Corp. data—low interest rates and the sluggish economy are driving cost cuts. Online banking now accounts for 53% of banking transactions, compared with 14% for in-branch visits, according to research from AlixPartners. "There is no question that there is a long-term shift in the role of the branch and the need for them," says Robert Hedges, a managing director at AlixPartners. As a result, as many as one-third of the nation's branches now may be unprofitable, according to Simon-Kucher, which estimates that a typical bank branch needs at least $30 million of deposits to be profitable. Many of the closings are taking place in states that were the hardest hit by the mortgage meltdown and bank failures that followed. Nevada has lost 10.3% of its branches since 2009; Georgia has seen a decline of 7.7%, according to AlixPartners. Michigan has lost nearly 5%. In places like Athens, the closure of a branch can send ripple waves across the tiny economy. Surrounded by corn, soybean and dairy farms, Athens is about 12 miles from Battle Creek, home to cereal maker Kellogg Co. The closest bank is now eight miles away, in Union City. Based in Coldwater, Mich., Southern Michigan has $528.2 million in assets and operates 15 branches. It is a unit of holding company Southern Michigan Bancorp Inc. The bank closed the Athens branch in April 2011. The branch had $10.9 million in deposits in 2010, up from $10.3 million in 1995, according to FDIC data. By contrast, the bank's branch in nearby Battle Creek grew to $19 million in deposits from $11.5 million over the same period. John Castle, chief executive of Southern Michigan, said in an email statement that the bank took the "difficult step" of shutting the branch because it wasn't profitable. "Over a five-year period ending in 2010, neither loan nor deposit levels were increasing," he said. The rise of Internet banking, he added, "contributed to our decision to close the branch." Marcia Carman, who ran the branch until she retired a few months before it closed, notes that a number of businesses, including a chicken production plant, had moved out of town. "There was just no industry to replace those," she said of the commercial loans and deposits from those businesses. Yet even in the months before its closing, the Southern Michigan branch meant more to Athens than just a place to deposit and withdraw money. Three of the town's residents worked in the branch. The bank regularly sponsored youth athletic teams and frequently contributed to local fundraising drives. "If anyone came in looking for a donation, they were quick to do it," says Terry Henckel, who has lived in Athens for 65 of his 74 years. The shutdown prompted Mr. Henckel's daughter-in-law to pull her personal accounts out of Southern Michigan and move them to the Kellogg Community Federal Credit Union in Battle Creek. "Southern Michigan may not care that they lost my business, but I bet they lost more than they thought they would," says Judi Henckel, a teacher at the local high school. The Athens library and historical society also moved their accounts, says Ms. Henckel, who is on the boards of both organizations. Mr. Castle said that the bank has retained the "vast majority" of its customer base. Mr. Alverson, the village president, and other residents sent letters to 20 banks, inviting them to come to town and offering free office space for a year. When one bank executive expressed interest last spring, the town threw a pizza party for him that drew a crowd of 71. For much of last summer, residents pinned their hopes on Eric Eishen, chief executive of Sturgis Bank & Trust Co., another Michigan bank. At a meeting in July, Mr. Eishen complimented the Athens residents for their determination in trying to recruit a new bank to town. "You are doing everything right," he told them. But Mr. Eishen also expressed concern that Athens wouldn't provide enough loan growth to support a new branch. In late August, Mr. Eishen told Mr. Alverson that his bank wouldn't be coming to Athens. As for the town's shuttered branch, Southern Michigan found a buyer in one of Athens' residents: Dave Enders, a coin dealer who stores his vast collection in the building's vault. "I came to this town because there was a bank here," says Mr. Enders, who bought the building for $35,000. "Now I wind up with the bank building, but no bank."